Well I have some very exciting news for everyone, back in October of 2009 we here at Pagan pages were honored with a wonderful music review and in interview with George Nicholas from Cernunnos Rising and it seems that our good fortune has followed us as we will be once again having a the fortuitous opportunity to be the first to spread the good news that Cernunnos Rising and George Nicholas are coming out with a brand new album and are bringing their music to the US, which we will be featuring here very soon; and as always George Nicholas brings forth the songs of the Green man and the musings of the Deep woods with his exhilarating Druidic music. 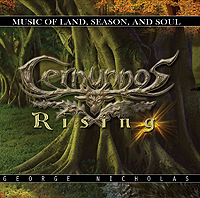 For those of you who have never heard of the band Cernunnos Rising, let me introduce you to the men behind the music, George Nicholas and the band Cernunnos Rising (Simon, Nick and Phil). George is the founder and main driving force behind the registered charity ` art For Their sake’. As for the rest of the band well, what is there to say except WOW. Cernunnos Rising is in my opinion, one of the greatest up and coming bands I have had the pleasure of interviewing to date. Pagan Pages: When you are not making music how do you earn a living? PP: What other creative outlets do you have? GN: I have a very potent imagination and this has come in handy when involved in the creation of some of my inventions, one that I had the most fun with was the creation of the children’s character concept THE WEREBEARS. It took me a whole year just to do that cgi animation trailer on the website with a friend but I can honestly say I learnt an awful lot in the process. Anyway! I make sure I’m active and effective in this modern world we live in, share my skills, and strive to be of benefit in any way possible, and that includes my poetry and music, and I hope people share my sentiments and enjoy the words and feelings I’m trying to share. My heart is with spirit and essence of the green world and nature and all my `inspiration` comes from my time in `connection` with her and my pursuit of the essential principal of balance within and without. I try to express this in my album Cernunnos `Wild Soul` And convey the message of the need to acknowledge the turbulent forces within as well as without! Also I, like many have a deep reverence for the seasonal aspects and complexions of the year and wished to pay tribute with my words and music; The journey of the soul, and The Coming and Going features heavily on the album and a song about my very earliest recollection/dream about waiting to come into existence and having my chance to become me, to become my wonderful children! PP: Can you tell us a little more about yourself and the rest of the band? GN: Some details on our Simon… At 22 years of age Simon is a very versatile and competent musician and multi-instrumentalist. Simons love of nature is such that we don’t often see him much as he disappears to the mountains of north Wales with his backpack full of apples and nuts, and his flute protruding from the top, often stopping in beautiful and ancient locations playing his flute like the great god Pan annoying all the locals and wildlife (Joke)! Simon has been a member of Cernunnos for six months and we bumped into each other at the ancient monument and burial site of Bryn Celli Ddu, on the Isle of Anglesey, North Wales; Simon now lives by the Formby Nature Reserve on the North West coast. Simon works and looks after old people and is a qualified chef, but they are all very unhappy with the constant diet of apples and nuts he provides (another joke maybe). All Joking aside Simon is a very caring and helpful soul and will often seek out opportunities to help wherever he can, in work or the local community. He has now become a full time volunteer of the charity we run called art For Their Sake. Our other band member Nick Reynolds, At 49 yrs of age comes from North Wales and lives in a little place called `Nercwys`. Nick is a bass guitarist and session musician and stands at 6ft5ins tall and is a multi-media designer. Nick was one of my layout artists and scriptwriters when I produced the Werebears comic many moons ago. Nick is another forest dweller and has this longing for the wilder places that we all share. 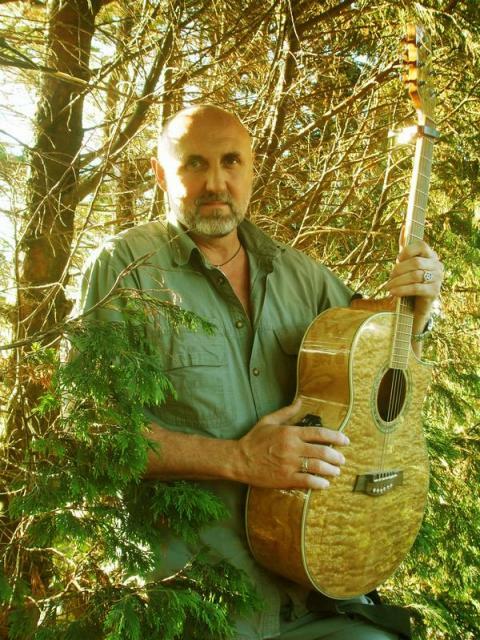 Then there is Phil Orem, he owns and runs the studio where we are doing our album. Phil is also the owner and engineer/producer of “The Doghouse Studios” and has worked in recording since 1984, working with some of Liverpool’s finest bands along the way. He set up his first studio back in 1987 with little more than a Tascam 244 and a couple of mic’s, and has progressed to the current Pro-Tools based set up he uses today. As well as running The Doghouse Studios, Phil has worked with several top North-West show bands, including The Untouchables, The Emotions” and The Memphis Soulhounds. He is currently Playing guitar for The Salford Jets who had minor chart success back in the late 70’s with such songs as Gina I’ve got a Cortina, Manchester Boys, Who you Looking At and Looking at the Squares. He Is also with Mike Sweeney and the Thunderbirds a 60’s 5 piece Band playing revival weekends with the likes of The Foundations, Steve Ellis (love affair), Herman’s Hermits, The Troggs, The Merseybeats and The Searchers. Now as for me…mmm, where to start? I was born 1955 in Liverpool, England, the usual very poor upbringing and childhood I discovered at a very early age i was artistic and creative and had an unbridled imagination and often thought about `the other realms` and their inhabitants, maybe most kids do, but my sketches of them upset my parents a bit. I spent most of my time in the local woodlands/cemetery, an amazing escape from the not too distant urban sprawl and noise. I used to love to draw trees, and this place became my own little timeless wildwood. Enduring the bullying that went on for most of my early years i decided to pursue `boxing` as a form of self defense and became very successful along with my crazy brother Ray who is now a very busy and respected pro Stuntman. We soon discovered how to use and direct that Chi force with formidable results often many bouts ending with left jab knockouts?, I found the whole thing very interesting and I am convinced it was the power of intention and mind, I now know in my later years that this is the case, and the same `energy`, direction, and intention of mind, and imagination can also be used to creative ends, or to destructive ends. For the last 40yrs I have made a point of using my `creative` skills to benefit others particularly those disadvantaged and ill, hence setting up the charity art For Their Sake this is one of the `loves of my life!. After being accepted into art college at the age of 15 yrs of age and coming out of that straight into a no job situation, I found myself working on building sites, and nightclub security in the unfolding years. (these were black soulless years for me, trapped in a city of conflict and crime).I eventually found myself a job as a scenic artist at the Empire Theatre, I stayed there until i was made redundant and cast back into the city rat race, I then found myself a job as a sign-writer, that lasted a year and I was made redundant again(I`d had enough). I immigrated to Georgia, U.S.A..and made my way to the very `green` Jonesboro. At last!. somewhere with trees; I ended up being a full time pro-Fireman, and also an E.M.T, and paramedic, ran a sign company, and art studio. It was bliss for a couple of years until I smashed and broke my back in a serious fire falling through several floors, … My first Daughter Sharon being born with medical problems, my house being cut in two by a massive tree during a storm, my Dad suffering stroke problems and a random attempted murder on my brother Ray, and I had two heart attacks due to a stupid doctor giving me massive muscle relaxant overdose( twice). I returned home to merry old England and her ancient places and distinct seasons and realized and practiced my inherent spirituality, and so the journey began. children’s hospital, this earned me a place in the Guinness book of world records. Although they sent me the certificate with the hospital name on it and not mine, (Never mind,. the pleasure was in the doing)!. It was about this time I became a singer, and also started doing some acting on TV. I also worked for an animation company and this prompted me to become a pro-cartoonist, and create my own characters and syndicate them to all the newspapers,.. this then led to a full time occupation of publishing and creating my very own children’s comics nationally selling 100 thousand of each issue, these years were great fun, but I still just wanted to go sit in the woods and write my songs and poems, and soak up that awen, mmm! The next period led me to invent the werebears , wow! Things became busy and I ended up in the U.S. again talking to film giant Universal Studios and others; and secured a very successful toy deal and publishing deal back home. That was years ago but there seems to be new interest in the werebears and I’ve just spent the last year creating the new hybrid toy that not only changes from cute to nasty, but he howls if you squeeze his paw, and his eyes light up in the dark,.. I can`t help myself , I just have to be doing things! If this concept is a success again, I want the royalties to go to our charity because it will help fund all the many projects and schemes with have on our `to do` list, some of them very big indeed! and very nasty condition called Llabrynthitis, this is a deep middle ear infection resulting in your whole world spinning violently `round and `round constantly with no let up, needless to say this makes the sufferer violently sick and constantly vomiting, for about 8 weeks solid ( it is possibly the worst thing I’ve ever had and makes you want to give up and catch the next bus to Tir_na-nog!). Anyway making the most of this period of not wanting to open my eyes in case I fell off the world, I had time to think and refine and decide upon my songs, as a result of this forced reflective void in my life, I made up my mind and final decisions concerning the songs and so this is where we are today. I feel I have been totally true to myself and have reflected my feelings and sentiments and beliefs in the words and music(feels weird!). All this has taken six months up to now. What started the ball rolling was my 14 yr old daughter Katie just decided to design a logo and my space page ( the stuff that`s up there now) and put my stuff up to see what kind of feedback we`d get,…What can I say, Things are manifesting for sure! Jumping the gun a little the title for the next album is URBAN DRUID, should be interesting, as there are thousands of the buggers out there! Just to finish off we will be creating our own CernunnosRising website and our music and our own home spun album will be available from there in the very near future! PP: Bountiful Blessings go out to George, Simon, Nick and Phil. Thank all you so very much for grating the readers and I such a magnificent opportunity to be the first to interview such an absolutely wonderful up and coming group of artist. It has truly been awe an inspiring experience. Again thank you.